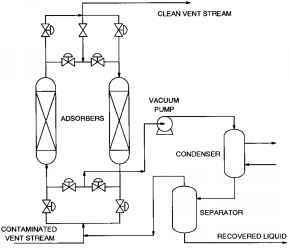 In adsorber design, a design engineer must have knowledge about adsorbents, the adsorbent operation, and the regeneration operation. Favorable properties of an adsorbent include good thermal stability; good mechanical integrity, especially for use in a continuous removal or fluidized-bed system; high surface area and activity; a large capacity for adsorption; and facile regeneration. In some cases, the spent adsorbent must be disposed of, in which case it must be inexpensive and environmentally benign or of commercial value following minor processing. Activated carbon and the series of microporous alumi-nosilicates know as zeolites are important adsorbents. Table 5.20.5 presents the properties of the widely used zeolites. Because water vapor is not considered an air pollutant, the adsorption capacity of a zeolite for water is not a benefit. Activated carbon is a highly porous adsorbent with a high capacity for a range of adsorbates (see Table 5.20.6). Thermal or vacuum desorption permits the recovery of several adsorbates from both zeolites and activated carbon. Thus, these materials are valuable for the recovery of fugitive reagents or solvents. Flushing with water removes inorganic adsorbates such as SO2 adsorbed on carbon but the carbon must be dried before reuse. Figure 5.20.13 shows a zeolite-based adsorption system for solvent vapors. In selecting an adsorbent, the design engineer must ensure that the adsorption isotherm is favorable. If the adsorption isotherm is unfavorable, the loading is low, and the process is rarely economic. Irreversible adsorption should be avoided unless regeneration is not required. If the feed gas is at an elevated temperature, cooling the gas stream may be required. The cost of cooling is significant and should be included in cost estimates. 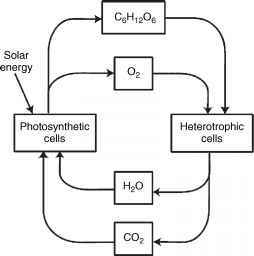 Some adsorbates decompose in adsorption or regeneration. Many decomposition products (e.g., from chlorinated hydrocarbons, ketones, and acetates) are acidic and can corrode the system. They also need an additional separation step if the recovered adsorbate is valuable. Using an adsorbent system for continuous solvent recovery from a vent stream requires using multiple beds. Regeneration of the adsorbent and recovery of the solvent can be accomplished by several means, including PSA (see Figure 5.20.12). Alternatively, a system can recover the solvent by sequentially steam treating the spent adsorbate to remove the adsorbed solvent, drying the carbon with hot air, and cooling the bed to the operating temperature. The number of beds required depends on the effective time-on-stream of the adsorbent bed and the time required to regenerate the carbon. The determination of these parameters is described next. Table 5.20.7 shows typical operating parameters for adsorbers. The design and operation of an adsorber requires knowledge of the adsorption isotherm, mass transfer, and axial dispersion of adsorbates. Heat transfer is also significant at high pollutant concentrations. Generally, if the feed rate is less than 12 m3/sec, purchasing an adsorber package from a reputable supplier is more economical than custom building a unit.